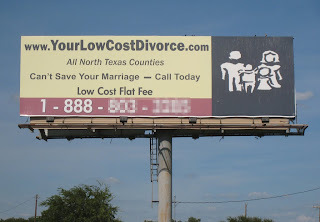 What strikes me about this advertisement for a "low cost divorce" is that it shows the silhouette of a family that appears cohesive and together. If they're trying to sell divorce lawyers, shouldn't at least one of the silhouette parents be standing off to the side? And shouldn't one of the silhouette kids be acting out their frustrations? Looks like each parent has grabbed a kid and is ready to split.